Crusader. Latin Rulers of Constantinople. AD 1204 to 1261. NICE FOR ONE OF THESE. In AD 1204, during the 4th Crusade, some of the Crusader leaders sacked the Byzantine city of Constantinople and set up their own small Kingdom, which was maintained until 1261. They produced coins of the Byzantine trachea style, which were nearly all over struck on earlier Byzantine examples, often cut down to a smaller size, and normally very crudely struck. The example here was picked for a superior strike, from a recent hoard of high quality specimens. Denomination : Billon trachae (small module). 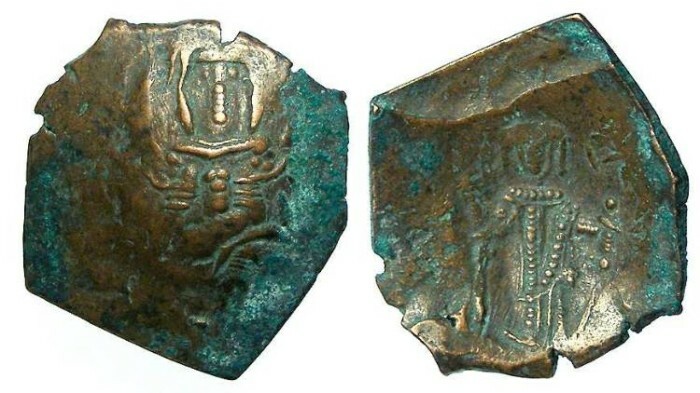 Mint : Constantinople. Reference : Sear Byzantine - 2044. Size : 17.1 x 20.3 mm scyphate. Weight : 1.70 grams. Grade : VF with a superior strike for this issue. Obverse : The Virgin Mary enthroned. Reverse : Emperor standing forward, holding a labarum.